The Netherlands are European Champion of Baseball. On Sunday the Dutch national team beat Spain 3-2 in a thrilling championship game at the European Championship in Hoofddorp, Netherlands. Spain tied the game in the eighth, but the Netherlands prevailed after all, scoring the game-winner in the tenth on a walk-off single. For the Netherlands it’s the 22nd European Championship in the 31st final and 31st participation. For Spain it’s the second silver medal since 1954. They had last played in a final in 1955, when they were European Champion. 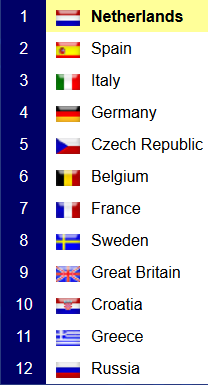 Italy captured bronze after finishing the Winners Round Robin in third place ahead of Germany, Czech Republic and Belgium. The final between the two dominant teams of the 2016 tournament was all the neutral fans hoped for. It was a dramatic back and forth battle in front of a full house with an official attendance of 3,350 at ETO Ballpark. The Netherlands struck first, taking a 2-0 in the second. Gianison Boekhoudt, Dwayne Kemp and Randolph Oduber loaded the bases with no outs and Nick Urbanus hit a single through the middle for a two-run base hit. However the Dutch failed to blow the score open in the frame and Spain stayed in the game. In the following innings Spain had plenty base runners and opportunities to tie the game. They had runners on first and third in the third, but Engel Beltre struck out. In the sixth they loaded the bases with two outs, but Jesus Ustariz grounded out to short. In the eighth it looked like another missed chance, when Oscar Angulo and Beltre led off with back to back singles and then Angulo got picked off by Dutch catcher Dashenko Ricardo at second. Jesus Golindano followed to strike out on three pitches for the second out in the inning. Jesus Martinez then stepped to the plate and hit a two-run home run over the fence in right field to silence the crowd. 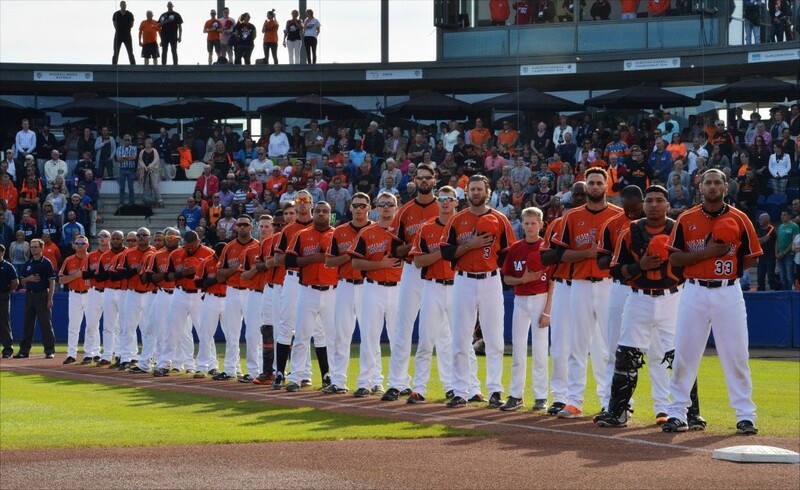 After the Netherlands missed out on scoring in the bottom of the eighth after a Yurendell De Caster leadoff double and a pair of 1-2-3 halves in the ninth, extra innings were needed to decide the outcome of the championship game. With the extra innings rule in effect two runners were placed on first and second to start the inning. Spain played it by the book and ordered Luis Guillorme to lay down the bunt, moving Blake Ochoa and Daniel Martinez to third and second with one out. Angulo and Beltre were up, but both didn’t put the ball in play against Dutch closer Loek van Mil, striking out swinging. The Netherlands didn’t really have a chance to execute the sac bunt in the bottom half of the tenth, as Christopher Garia got hit by a pitch to load the bases with no outs. De Caster wasted no time and hit a walk-off RBI single up the middle for the game-winner. Prior to the game a moment of silence was held for Alonso Perez, Vice President of the World Baseball Softball Confederation, who died last week. Haarlemmermeer deputy mayor and alderman John Nederstigt threw out the ceremonial first pitch. Dutch outfielder Kalian Sams wasn’t in the starting lineup due to the birth of his son Dean. After his wife gave birth he raced from the hospital to the ballpark and joined his teammates in the bottom of the fourth. In the top of the eighth he entered the game as defensive replacement in right field and singled in his lone at-bat shortly after. During the closing ceremony Netherlands shortstop Stijn van der Meer was named Most Valuable Player of the European Championship. Yurendell De Caster (Netherlands) received the best batter award. Enorbel Marquez-Ramirez (Germany, Best ERA) and Antonio Horvatic (Croatia, Best W-L) shared best pitcher honors. 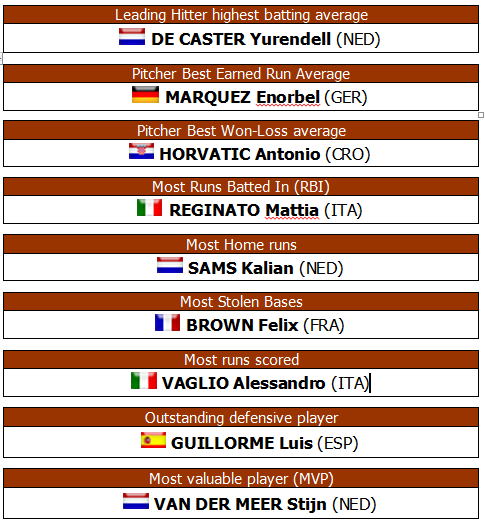 Mattia Reginato (Italy, most RBI), Kalian Sams (Netherlands, most home runs), Felix Brown (France, most stolen bases), Alessandro Vaglio (Italy, most runs scored), Luis Guillorme (Spain, outstanding defensive player) got awarded as well.